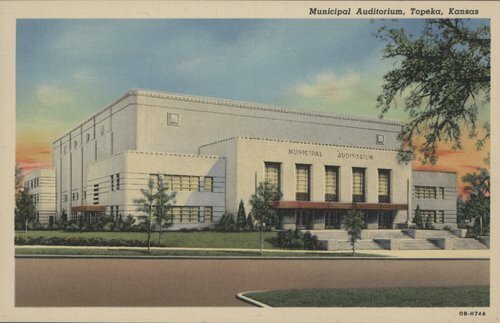 A postcard showing the Municipal Auditorium, Topeka, Kansas. In the late 1930s the Federal Public Works Agency (PWA) approved a grant for nearly $7,000,000 to construct the Municipal Auditorium. Designs for city offices were added to the north side of the structure. Contracts for the building were awarded to F. M. "Earl" Spencer, general contractor, A. Tucker Electric Co. for wiring, and U.S. Engineering Co. of Kansas City for plumbing, heating and ventilation. The building took three years to complete.